Yeah i was looking at those are the pet shop but the ones by Exo Terra or whoever, they flake apart. I was actually talking to a guy on the chondro boards about those and he told me he seals them with reptile sealant and they last a pretty long time if done like that. 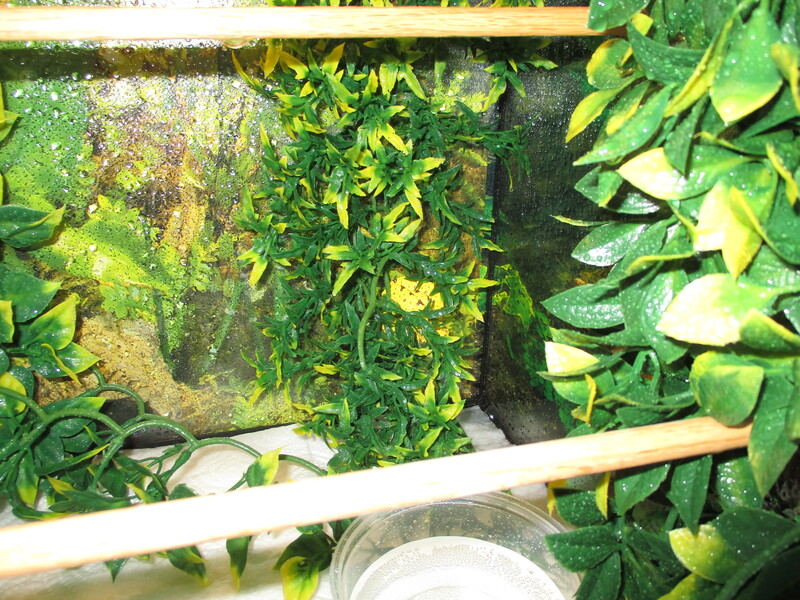 I think Pat's cage is done except for maybe a little potted Pothos or Philo later. I dont want to clutter it up too much as i want a fairly open place i can feed him so he doesnt snag a plant leaf or something while striking. Well, got an update. Pat took his first poop and second piss with me. Guess sometime last night he dropped a little baby deuce and pee on the paper towels and i found him in a new cooler spot. The little bugger can really blend in good. Well apparently he shed last night too. I found a little 1 piece shed wrapped up around the top of his front left plant. So we have 3 achievements from Pat last night. He pooped, pissed and shed in 1 piece. I am so relieved. The eating part i think we have down more or less as he took 2 meals with already no problem. Bet you thought he was dehydrated didn't you? I was worried about mine being all wrinkly until one night she just decided to shed. I am thinking they don't really show blue eyes like most terrestrial pythons. Haha yeah, i was panicking on the chondro boards. People were telling me he is probably in shed and as long as i saw him drink and have elevated water bowls by his perches, he should be fine.He drank about 1/2 of one of his 1/2 ounce perched water dishes as i have 4 around perches. Then like i said, this morning i found all that. And then when i did his daily misting of his cage, he woke up, climbed up through the plant he was on in the pic, took another drink from one of his elevated drink stations lol and then proceeded to curl back up on the top perch under his heater again. I was also panicking as i havent had him poop for me since i got him about 10 days ago and only pissed once. They told me there again, he is probably fine especially if he is going into shed. I knew GTPs have a slower metabolism than other pythons but it's almost like having a baby boa with the amount they poop lol. A couple guys told me, they do the 3 meal rule. They will feed 3 meals and if nothing comes out the back end by the 4th meal, they will wait on it until the snake does it's business. What a beautiful little gem. Sounds like (s)he is well-settled and off to a great start! Yeah it's a whole new world with this guys. Your's sounds really healthy and that a wonderful thing!